I didn’t have many cookbooks when I was younger, I learned all about cooking from my mother. She’s my mama bird in the kitchen, I just watch and follow her. 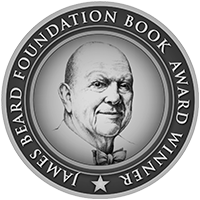 Then, in my late teens, she gave me my first cookbook, a detailed introduction to the most important basic techniques covering everything from eggs to soups, meat, seafood, and vegetables. It felt like she wanted to be sure that I wouldn’t starve when I moved out. The book was published in the 80’s and beautifully photographed. Quite minimal. I think, in regards to food photography, this book influenced my style of capturing food in pictures more than any other publications. It was my only cookbook for a long time, but I collected and wrote down recipes myself whenever I got the chance to sneak a kitchen classic from a friend or my family. Even in restaurants, I was never shy to ask, if they’d share a recipe with me (the ones that really hit me). This strategy led to a bursting folder packed with notes, snippets, and sheets torn out of magazines. I still haven’t cooked and baked all of the treasures collected in more than 30 years. It’s a steadily growing project. As I got into collecting cookbooks, Jamie Oliver’s books were one of the first added to the shelves. First as a present from friends, but later on I bought a few myself. I liked his style of playing with food. I was in my early twenties, I had seen and tasted many German, French, and Italian traditional classics cooked to perfection, by my mother and in friend’s kitchens, or at restaurants. But I felt like a younger voice. And Jamie’s voice felt just right at that time. In the end, I might have only cooked about 15 of his creations in all those years, but he inspired me a lot. And at least 5 of his recipes became staples that I still embrace today. There’s one recipe that I’ve been wanting to try for more than 15 years. 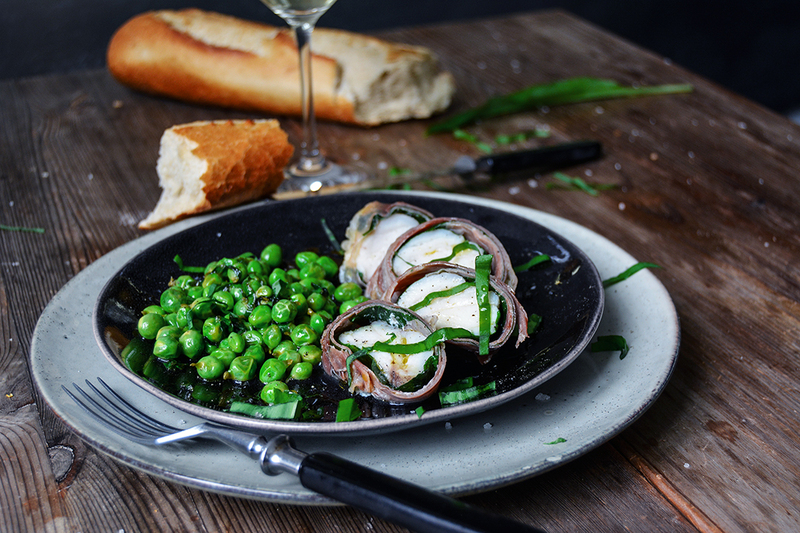 And again, I didn’t use it to follow, but to play with: Jamie wraps monkfish filets in prosciutto spread with pesto. It’s so simple, it looks stunning. 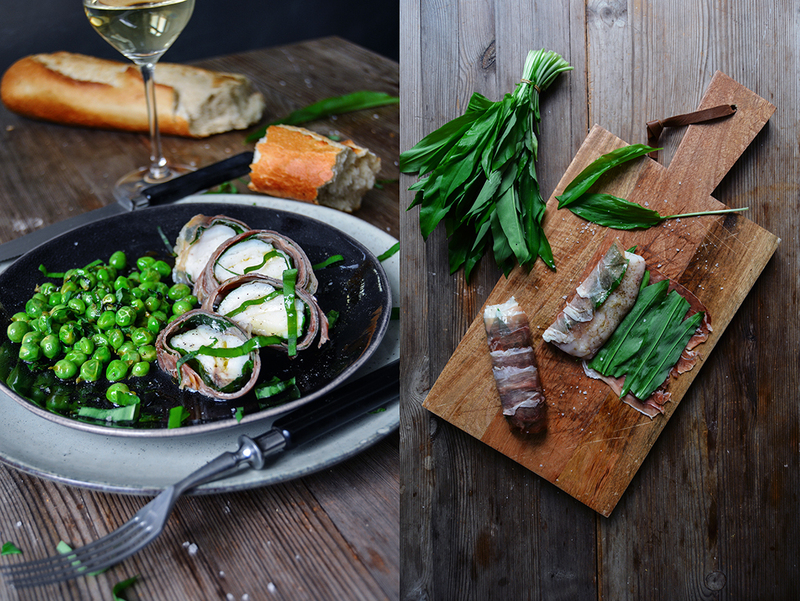 As spring is in the air, or at least the smell of ramps as you enter the woods, I decided to wrap my firm white fish fillet in ramp leaves and prosciutto di Parma. Thanks to Jamie, the cooking time and temperature were perfect. The fillet was tender yet firm. 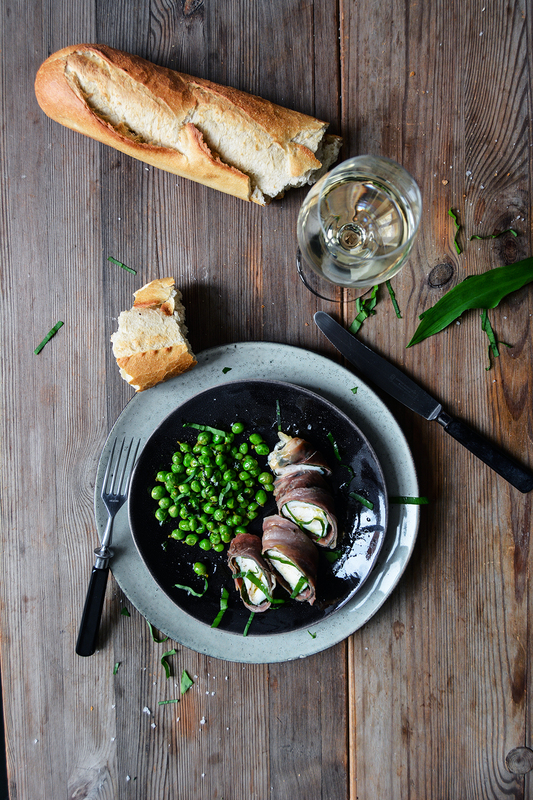 And the wrapping was spot on: green, fresh, and slightly salty. 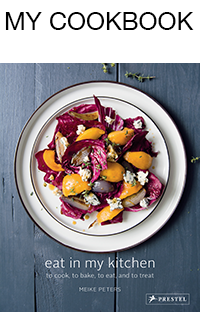 If you’re still looking for an Easter menu, what about skipping the traditional lamb roast and go for seafood? 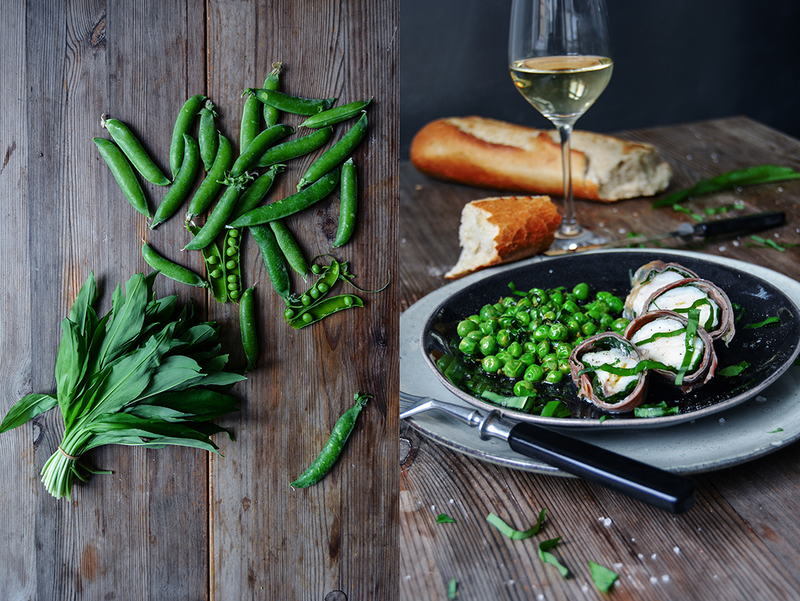 This dish is so easy, serve it with a bowl of lemony ramp peas and baguette (for the lazy ones like me) or Mediterranean mashed potatoes (either from my book, or try this recipe). And what about an eggnog sponge cake for dessert? Have a wonderful Easter time with your loved ones! Preheat the oven to 200°C / 400°F (conventional setting) and brush the bottom of a baking dish with olive oil. 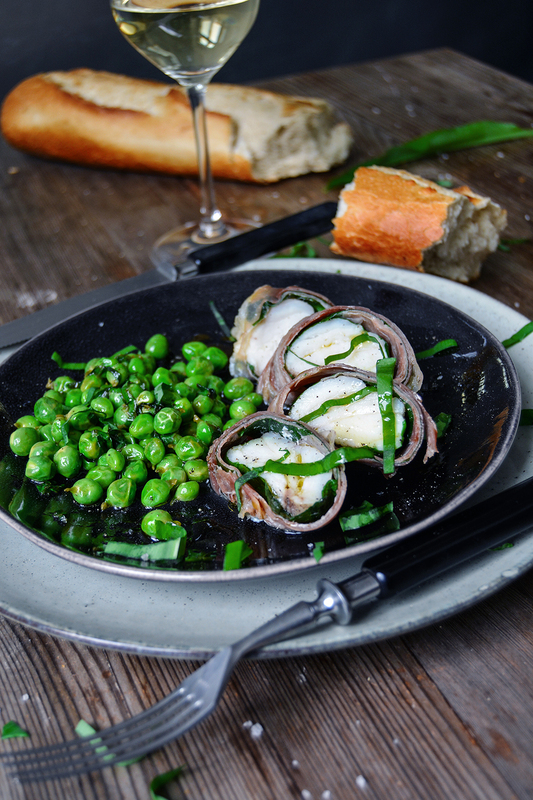 Cut the monkfish in half (lengthwise) and, using your hands, coat it in olive oil and season with salt and pepper. On a large chopping board, spread out half the prosciutto (overlapping slices). 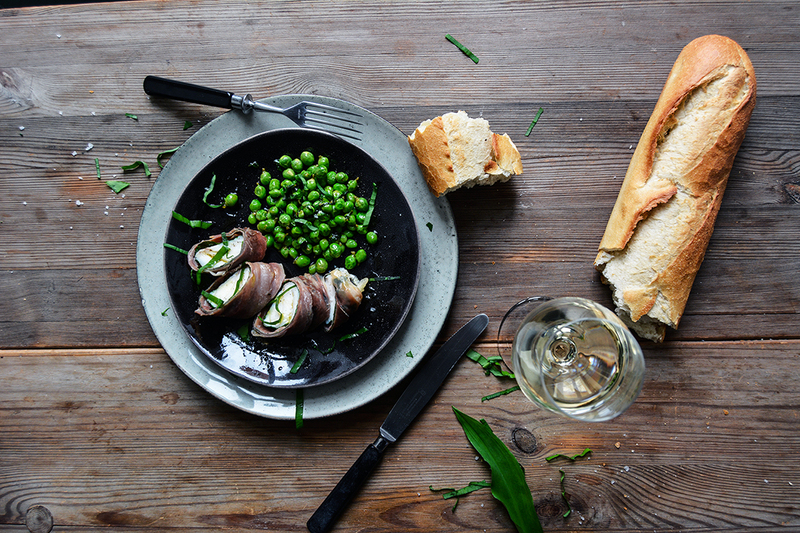 Arrange a layer of ramp leaves on top (laying across the prosciutto), then lay one half of the monkfish on top (see 5th picture). Roll and wrap the fish tightly and transfer to the oiled baking dish. Prepare the second fillet the same way and lay next to the first fish wrap. Brush the prosciutto with olive oil and bake in the oven for about 15 minutes or until the fish is tender. 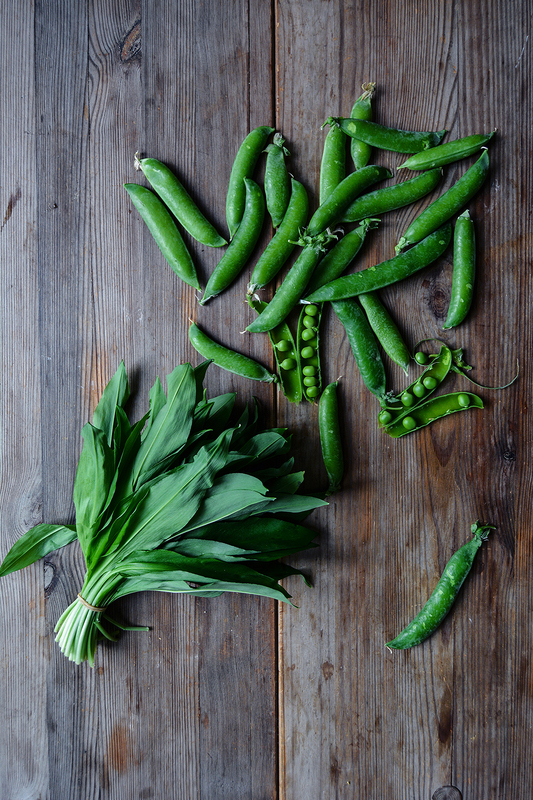 While the fish is baking, prepare the peas: Cut 12 ramps leaves into thin strips, set aside. Cook the peas in plenty of salted boiling water for 1 minute or until al dente. Drain and briefly rinse with cold water. In a small saucepan, heat a splash of olive over high heat, add half the chopped ramps, and take the pan off the heat. Stir in the peas and lemon juice and season with salt and pepper to taste. When the fish is done, using a sharp kitchen knife, cut the fillets into thick slices and divide between 2 plates. 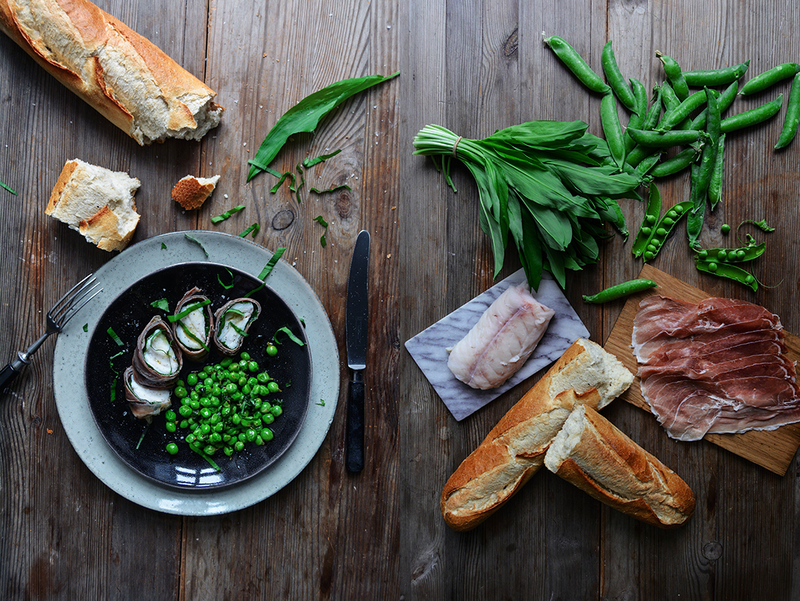 Serve with the peas sprinkled with the remaining chopped ramps, crunchy baguette, and chilled white wine. This looks delicious – we will make it this weekend! I have been scavenging “Bärlauch” for the last week from the park across the street (from way off the beaten path, where fewer dogs roam). But, I had to laugh when I translated “Monkfish” into German (we live in Bremen), and got “Seeteufel” (Sea Devil, right?) as the result. I guess it is a fish with a split personality! I used to live in Mannheim for a while and I always picked my Bärlauch from a park close to the river. The smell was mesmerizing! The poor fish is also known as frog fish, they could have given him nicer names. I can’t get ramps where I live. Do you have another suggestion, or can I just eliminate? Hi Vickie, you can replace it with spring onion, although it’ll taste a bit different. Cut the green part of the spring onion into very thin, long strips, spread this on top of the prosciutto and wrap the fish fillet. A layer of chives would also work. Thank you so much for the reply. I will try it. Happy Easter to you!